No matter their intention, whenever certain people attempt to get themselves out of trouble, they end up getting themselves into even more trouble afterwards. Yeah. It happened to my mate only the other day. 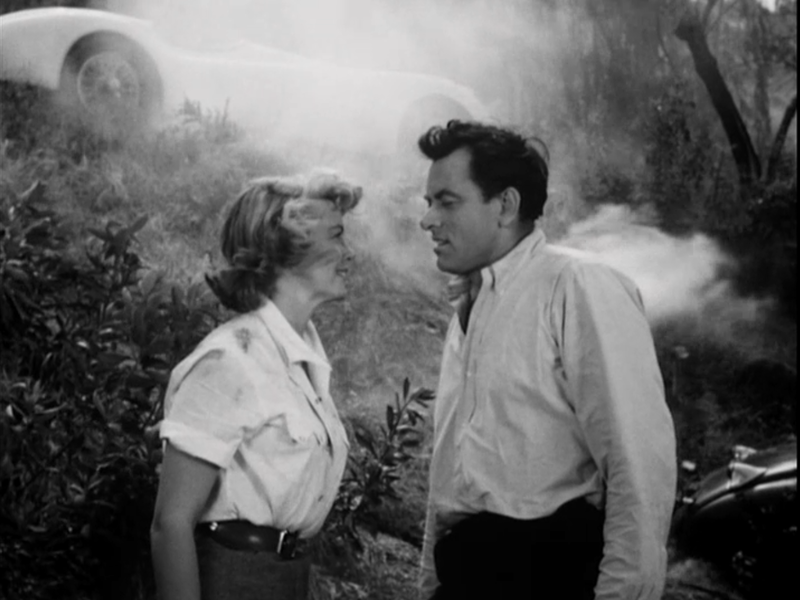 He wanted to buy a very exciting film so he could please his girlfriend, but what he got instead was this one Directed by Edward Sampson and John Ireland; and Starring John again with Dorothy Malone. It was made in 1955, and lasted for 75 minutes. Hey, Mack! Did you hear the news about that convicted felon who recently broke out of prison? You know. What's-his-name. Frank Webster (John Ireland). Well, just the other day whilst she was loitering around a diner, he kidnaps a pretty young racing car driver called Connie Adair (Dorothy Malone), and then escapes in her sports car not so long thereafter. Furthermore, once the police are informed about this brash and bold encounter, both Frank and Connie end up entangled in a racing car competition a long-long way down the lane. Granted, this doesn't happen to them straight away. No. Of course not. First Connie tries her best to get away from Frank in transit. Then they have to out manoeuvre the police at any given turn. And finally -- and only finally -- when Frank doesn't know which way to go, that's when they both end up in the aforementioned racing car competition I mentioned to you previously. Still, what next, huh? Can Frank enter said race under the assumed name of 'Bill Myerson'? And even if he does do that, can he pass the time-trials and then enrol into the competition, without any of Connie's friends figuring out what's really going on? No. I'm not telling you the answer to these questions, pal. But what I will say is what next transpires all shifts gear when a kidnapper tells his reluctant accomplice the truth about his own origins. As love turns into fire - a car needs a new tyre - an adventure goes on the skids - and look out, pal, beware of those strange looking grids. 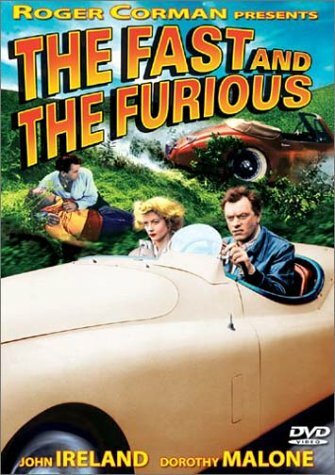 Now if you're able to look past the piss-poor processed shots and the dire camera work utilised, I'd say that you'd thoroughly enjoy this 1955 version of 'The Fast and The Furious'. Yeah. Honestly. In my eyes it's like a fifties homage to an eighties road-movie. It has a very straight forward approach with its story-line. It has the incremental budding romance between the two main actors. And it has that adventurous and bold streak this type of genre driven flick adders to by default. Granted, like I just said, I don't think that this piece would be everybody's cup of tea. Especially if you're a more modern-day viewer, who has been spoilt rotten with slick special effects and an all star-cast. Nonetheless, as a story goes in its own right, this is a very spirited production that has a lot of pluck and gumption that'll put many of the more recent Hollywood films to shame. Well, take a look at the basic structure of this tale for example. Act One: A criminal kidnaps his reluctant victim and then they have to dodge the police using the victim's sports car. Act Two: The criminal and his victim get to know each other whilst stumbling into a racing car competition by accident. Act Three: A hard-lined resolution eventually presents itself that defies the convention of your more 'paint it by numbers' productions. Furthermore, this film has other things going for it as well. Like the very straight laced acting, plus the brazen and 'in your face' attitude it conforms to. Also, let's not forget the filmic-facts? Right? (1) The 'American Releasing Corporation' first released this $50,000 dollar production on the 15th of February, 1955, and eventually clawed back $250,000 dollars at the box office. (2) This was the first major movie released under the banner of the 'American Releasing Corporation', which later went on to be known as 'American International Pictures'. (3) This whole film was shot within ten days. (4) The producers associated with the 2001 version of 'The Fast and The Furious', bought the title rights to this film, but did not buy the story rights to this film. Instead, that was used as the basic plot for the 1994 Charlie Sheen and Kristy Swanson action-comedy, 'The Chase' (5) Apart from the scenes shot in Keywest Studios, Santa Monica, the majority of this movie was shot on location throughout the state of California. This includes: Carmel-by-the-Sea, Point Dume, Malibu, and Monterey. (6) Loosely translated, this project was entitled 'The Raging Devil' in Germany, 'The Highway Killer' in Greece, and 'For Full Speed' in Denmark. (7) All of the road-racing scenes were actual stock footage taken from numerous races held in South California, shot side by side with other scenes filmed for the movie in itself. 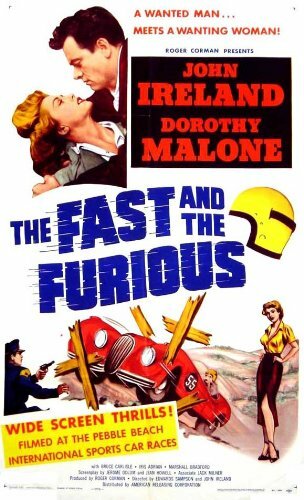 (8) The writer / producer of this film, Roger Corman, made a very silly mistake whilst he was doubling for one on the racing car drivers in this flick. Instead of losing the race like he was supposed to do, what he ended up doing was winning the race, because he was so 'caught up' in the moment. Don't worry though, this scene was re-shot afterwards. All in all 'The Fast and The Furious' is a very nice slice of yesteryear to watch. So if you're a fan of races and a timely tale -- yeah -- this is defiantly one for you. But if you're the type of person who prefers style over substance -- no -- please steer clear of this one, pal. You might get run over by accident. Ha!